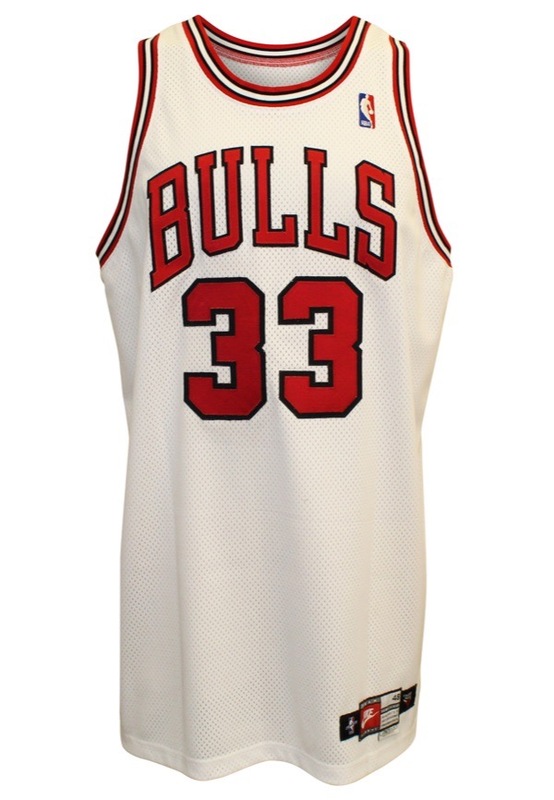 The 1997-98 season completed the Chicago Bulls second three-peat, winning their sixth championship in eight seasons. A seven-time All-Star, Pippen was named to three All-NBA First Team and was named NBA All-Defensive First Team eight times. Pippen was named to the NBA’s 50th Anniversary All-Time Team, has his No. 33 retired by the Chicago Bulls franchise and was inducted into the Naismith Memorial Basketball Hall of Fame twice in 2010. 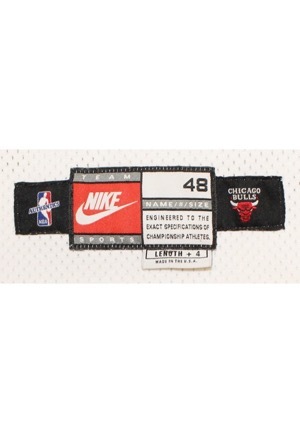 On the front left tail is the Nike manufacturer’s tag size “48”. Attached below is a flag tag that reads, “LENGTH + 4”. On the left inseam is a materials tag with washing instructions and a Nike “1997-98” tag. On the upper left chest is the official “NBA” logo embroidered. 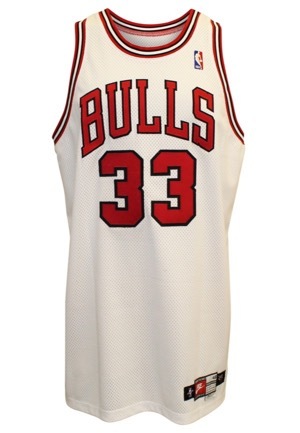 Across the chest reads, “BULLS”, the player number “33” appears on both the front and on the back and across the back reads the player name, “PIPPEN”. All numbering and lettering is done in red on black tackle twill sewn directly onto the white mesh jersey. This jersey is properly tagged, was presented to us as game-used and in our opinion shows excellent use.